“It’s possible,” he said of working with his once-rival. 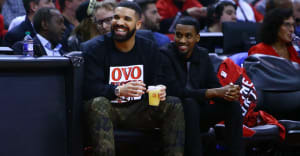 Meek Mill was a guest on Thursday's episode of Hot 97's Ebro In The Morning, and the Philly rapper discussed his recent release from prison, his friendship with New England Patriots owner Robert Kraft, and whether or not he'd work with Drake in the future. "It's possible, everything is possible. I ain't got no hate towards them," Meek said, adding that he appreciated Drake co-signing the "Free Meek" campaign in November 2017. "A lot of people could say Oh, he wanna attach to what's going on. I don't really care about that." The Drake/Meek Mill feud began in 2015 when Meek Mill accused Drake of using ghostwriters. The two exchanged disses in songs like Drake's "Charged Up" and "Back To Back," which was nominated for a Grammy. Drake stopped performing the song in January 2017. Meek also described a conversation with Kanye West, which took place just before he shared a memorial to the "Old Kanye" following West's endorsement of Trump. While some fans hope that West's alt-right stance is a ploy for attention, Meek doesn't share that opinion. "[I was] thinking he about to big Trump up and when his album drops he drop some bars on him, like a marketing plan. But when I talked to him, he was still talking the same thing." The revelation was especially disappointing to Meek, who says he was inspired listening to West's music in prison.